I’ve returned to my love of memory keeping recently and last month undertook a huge month-long project called December Daily where I chronicled our every day stories in a 6×8 album. I knew I’d have to travel with most of my supplies for our annual trek out to the family house in Utah in order to keep up with my commitment to complete the album within the first couple of weeks of the new year. Luckily, I had purchased a great storage case that I wanted to review in an upcoming planner-related video. I realized it would fit all I needed (and then some!) perfectly for my trip. 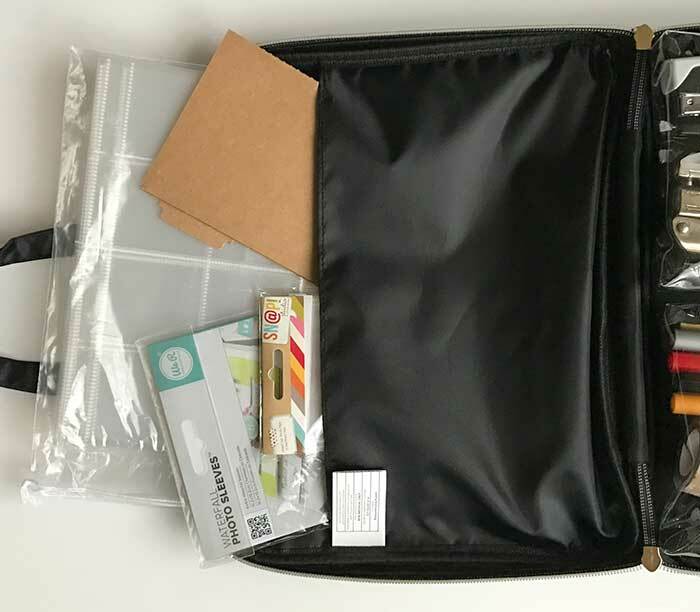 Today I’m sharing how I packed this case which is intended for planner-related storage with all crafty things. 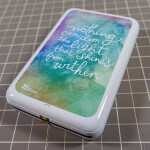 The Create 365 Storage Case is available at crafting supplies stores that sell The Happy Planner products. I found mine at Michaels where it retails for $29.99 but I was able to save 40% off using a coupon. The case is sturdy and well made with smooth zippers, reinforced handles, and mint piping. It measures 12” wide x 10.5” high x 4″ deep and is lightweight thanks to the nylon material. The case features two main compartments, each accessible by a double zipper which open up the case to lay completely flat. The front section includes a full zip pocket topped with a slip pouch and a larger clear vinyl zip compartment opposite that. I packed all of my letter stickers and some ephemera into the zip pocket. 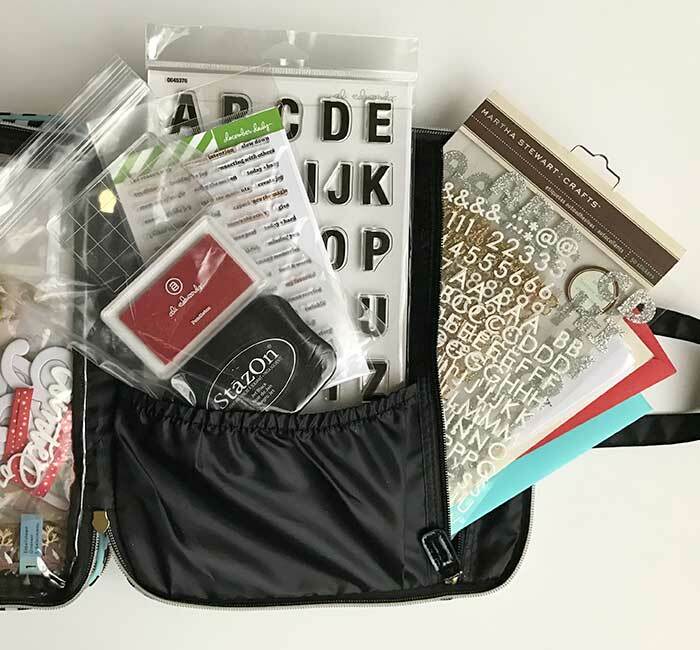 I used the slip pouch to keep my stamping supplies together, including a couple of ink pads and my clear stamping block which I laid flat into a zip top bag. 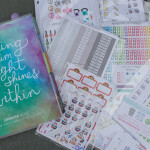 I decided to use the clear vinyl zip compartment to house all of the decor, patterned paper, cards, and stickers I wanted to bring with me so that I could see what I had on hand without having to remove everything everytime I sat down to work on my album. I popped small, like items into zip top bags to keep them together. 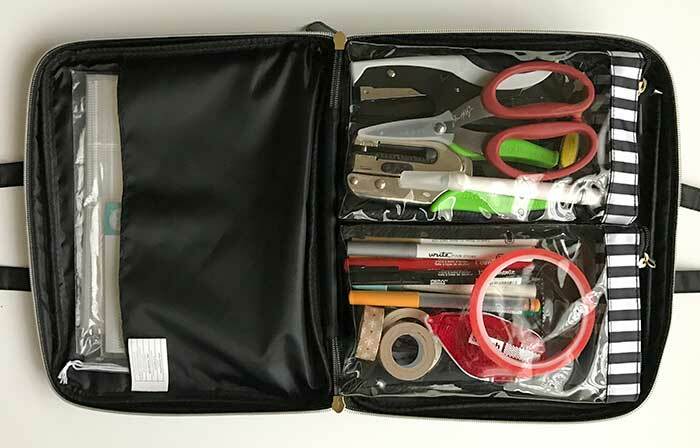 The back section of the storage case features a large slip pocket on one side and two zip top style vinyl pouches that velcro into the case to keep them in place. 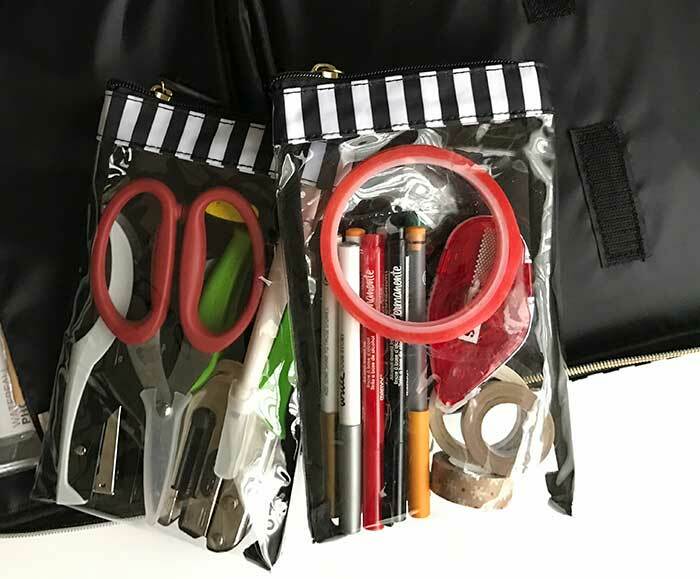 The two zip top pouches are the perfect size for crafting tools. I tucked my pens and adhesives into one and my other tools such as scissors, a hole punch, and tweezers into the other. Lastly, I tucked all of my page protectors and photo sleeves into the zip pocket. A place for everything and everything in its place! It was a breeze to pack up and use to work on my album when we were out of town. I kept everything stored in my pouch between crafting sessions, which helped a lot in keeping my much smaller desk space in the Utah house tidy while we were there. It worked out perfectly! I’d love to share this amazing storage case with two of you. The Create 365 Storage Case Giveaway will run until Monday, February 6, 2017 at 6 PM CT. The giveaway is open internationally. All entrants under the age of 18 must have parental permission to enter. TWO winners will receive the Create 365 Storage Case. 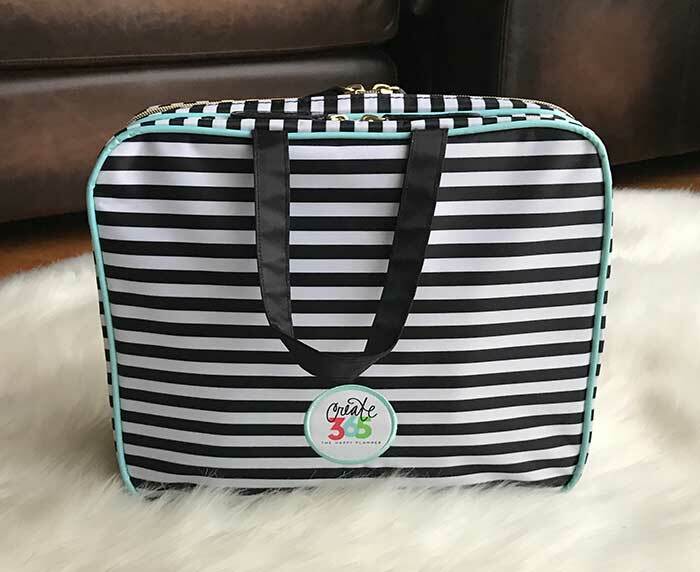 The Create 365 Storage Case worked out great for me to pack and use my crafting supplies on the go. I’m sure it’s also an awesome planner storage case, which is its intended use. I love finding gems like this case that work well for a variety of traveling and storage needs. 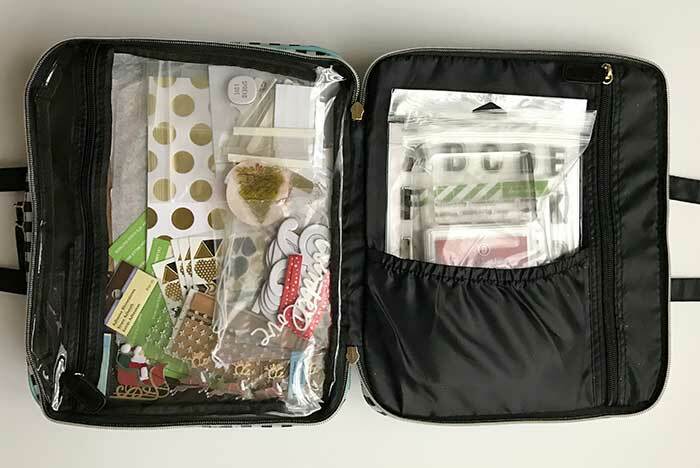 I’d love to hear how you pack your supplies if you’re a traveling crafter, too! I have the same exact case from 365 except it is Gold! I LOVE it! Jen, love your “Plan with Me” vlogs. I’ve copied a lot of your spreads. 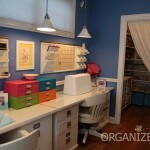 I did see this product at my local Michael’s and would be a fantastic storage case for scrapbook and planner items!!! I would probably use it to hold my planner-related items like stickers, stamps and washi tape and my project life accessories. Love the case, even though it’s intended for travel it would be ideal to keep everything together in a small living space! I love little ‘portable desk’ kinds of things, especially for someone like me who doesn’t have their own little office space – just a kitchen table! What a genious case! 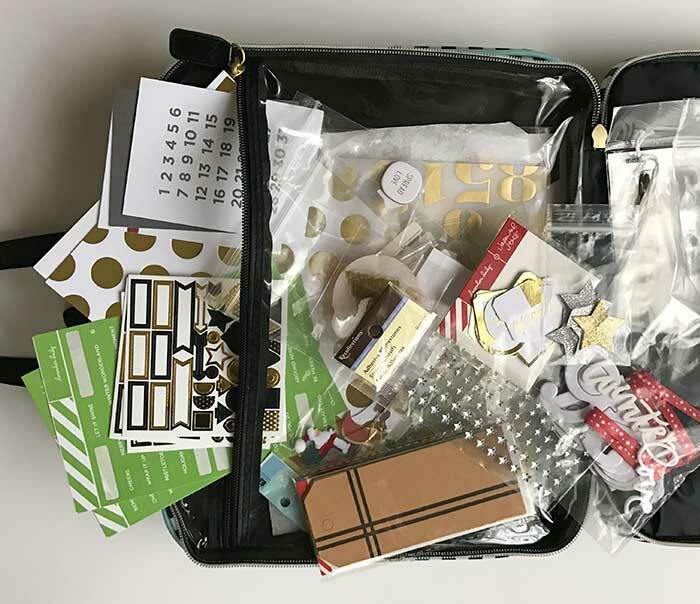 On previous trips (by car though), I’ve just been piling all my scrapbooking supplies in a plastic crate, but this would be so much easier and not so space consuming. Following your work in December has really inspired me to start PL again, haven’t made time for it in ages! Thank you for sharing this! I never would have thought about a case like this for my planner, but after seeing how you use yours I think it would be amazing for planner, accessories, and stationary storage. So excited that you’re sharing a look at your December Daily! And I’m sure we all understand that some things need to be blurred out for privacy reasons. And selfishly, I hope you’ll consider showing more of your Project Life book too. I love doing PL so much and always look to others for inspiration and ideas.